So, What's This 'Carefree Black Girl' Thing All About? As a black woman from Northern California, seeing other artsy African American women with natural hair and easy smiles wasn’t uncommon for me. That is, until I moved to New York where people responded to my grin by saying ‘You’re not from here are you?’ It was then I realized there was something to this creative girl of color thing, like a Zooey Deschanel but one who likes a good Young Jeezy song. After ten years in Brooklyn, I can safely say that this borough, and the city of New York in general, is an explosion of my creative cousins and apparently we’re an Internet army. 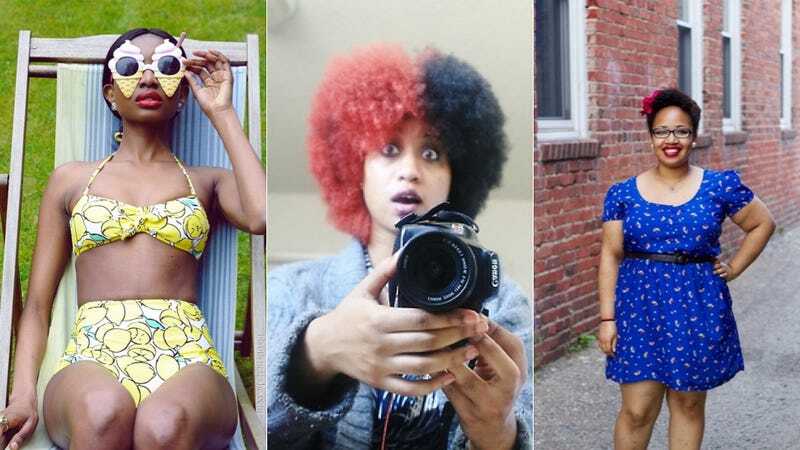 Jamala Johns, founder of the awesome Tumblr Le Coil — which posted striking images of black women and men — writes at Refinery29 that the creative army is actually called The Carefree Black Girl; ladies like Chiara de Blasio (with her hippie flower headband), Solange and her eclectic style and Janelle Monae's futurism are their patron saints. As I written before on Jezebel, seeing someone who looks like you is a powerful thing for people, especially if your ethnicity isn't often represented or is marginalized in mainstream culture. If you see a woman of color enjoying her life, then so does someone else. That positive image alone can work to break down the harmful stereotypes that are projected onto black women and other women of color. And this movement isn't relegated to just the Carefree Black Girl website, other tumblrs and Facebook pages are directed at positive body imagery for women of color also, like Dr. Yaba Blay's Pretty. Period project that works to combat colorism and encourage little girls to see their own beauty. Bust out your best not-really-matching-but-well-coordinated outfit and favorite hair styles ladies, it’s a revolution!